In a twin pack of mixed pattern ladies 15 denier weaves, these Charnos Trouserwear Dots and Spirals Knee Highs bring together the best of British design and Italian manufacturing for exceptionally pretty, practical knee socks that are strong enough for everyday wear. 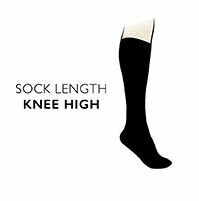 The deceptively delicate, sheer 15 denier mesh is smooth, and has a useful matt appearance, but is helpfully reinforced at the toes, giving them added durability. The cuff band is opaque, and provides essential grip.